“We can beat them, forever and ever! Or we can be heroes, just for one day!” Blake Wheeler had something to say about his team’s play on Wednesday. Most of it wasn’t very good. Well the man they called Wheels had Jets fans feeling Hunky Dory as his overtime goal helped the Jets edge the Nashville Predators 5-4, under the moonlight…the serious moonlight in frozen Winnipeg. Once again, the Jets started slowly as Nashville rookie Kevin Fiala scored his first NHL goal after only 58 second had elapsed. The Jets start games by putting out fire by gasoline recently which has led to trouble on most nights. 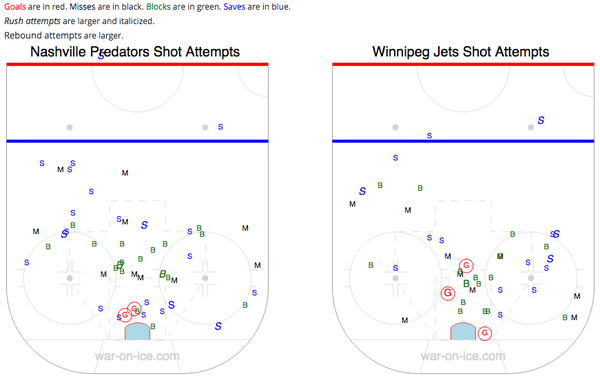 But the Jets showed some resolve in the second period. Dustin Byfuglien bookended the period with a pair of goals with a Bryan Little tally thrown in between to give the Jets a two goal advantage after two. The third period felt like Life on Mars. Nikolaj Ehlers breakaway goal six minutes into the third seemed to seal the deal. But the Predators rose up like Lazarus. The turning point was when Byfuglien collided with Cody Bass and Big Buff fell awkwardly. Getting up, Byfuglien was favouring his shoulder and didn’t return. The Predators got goals from Ryan Johansen and Eric Nystrom under three minutes apart to pull within one. The referees took over for a bit, making some questionable calls on both teams that forced some three-on-three hockey in regulation. The final three minutes were crazy as the Jets were playing rock n roll suicide in their own end. 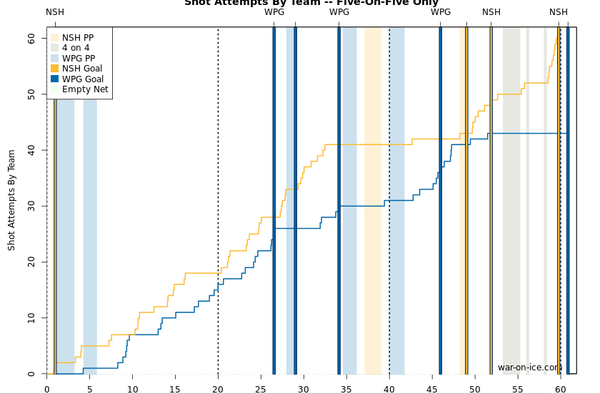 It ended up costing them as James Neal tied it with 14 seconds left to force overtime. Just when it looked like Jets fans were going to learn another heart’s filthy lesson, Wheeler’s snap shot 51 seconds into overtime sending Jets Nation into the golden years. Ch-Ch-Ch-Changes: With Byfuglien’s status unknown, there could be more changes in the Jets roster. Paul Postma, who is on a conditioning stint with the Manitoba Moose may get a chance with the big club. Jay Harrison is another candidate to get called up. The long shot is Josh Morrissey but there’s a better chance he’ll end be a Starman for the Moose this season. Wham Bam Thank You Ma’am: This was an intense, physical contest that the Jets need to be involved in. Both teams were in a feisty mood as they were desperately trying to shake off losing streaks. The Jets will need to bring that intensity every night if they have any shot at the playoffs. Young Americans: OK, maybe Byfuglien and Wheeler aren’t that young but they are American and they were vital to the Jets success. Meanwhile, the real young American, Connor Hellebuyck was solid between the pipes, stopping 31 out of 35 shots. I have a feeling Hellebuyck will be achieving some fame very soon. Byfuglien’s contract demands are going to look like the Powerball jackpot after tonight’s game. It’s almost like Ehlers is plays better with guys not named Thorburn. Weird. Put on your red shoes and dance the blues. Thank you David Bowie for the inspiration and the music. As Jeremy Wiebe has pointed out in bowie-speak: All you’ve got to do is Win, so Watch That Man, and All The Young Dudes, when your Under Pressure. Little Wonder, that comeback was a like a Slow Burn, and the Last Thing You Should Do. I wouldn’t be Telling Lies, if I didn’t say I was Afraid. It certainly was a Miracle Goodnight when Blake made sure we Survive(d). Well I Know I’s Gonna Happen Some Day and it’s Little Wonder people say we’re Kooks because It Aint Easy. And though it may be Five Years with Changes we can be Heroes.